US Airways is offering a 100% bonus when you share miles, through October 15, 2013. Sharing the maximum amount of 50,000 miles (i.e. paying to transfer them to someone else’s account) costs ~$568, including a $30 processing fee and 7.5% excise tax. But the person to whom you transfer the miles would earn an extra 50,000 miles. So you’ve essentially paid 1.14 cents per mile ($568 / 50,000 US Air bonus miles) for the 50,000 bonus miles which is quite a good deal! You would pay ~$1,026 if you bought 90,000 miles for a Business Class award to North Asia with a stopover in Europe (subject to award availability & taxes and fees, of course) at 1.14 cents per mile. Note that the maximum bonus is limited to only 50,000 miles per account with this current 100% bonus promotion. This isn’t such a great deal for domestic coach travel because you’d pay ~$285 for 25,000 miles (25,000 miles X 1.14 cents) which is usually around what a domestic round-trip ticket costs. But it could make sense for last minute flights or flights on expensive routes. This could even be worth it for coach tickets to Europe. For example, it costs 60,000 miles for a coach ticket to Europe. It would cost ~$684 to buy 60,000 US Air miles (60,000 miles X 1.14 cents per mile), which is often cheaper than the retail price of a coach ticket to Europe. However, I wouldn’t buy miles unless you have a trip in mind for the miles because the US Air award chart could change at any time. The Terms & Conditions say that your US Airways account must have been open for at least 12 days before purchasing miles. And the offer ends on October 15, so there isn’t much time to sign-up for a US Air account if you don’t have one! Each account can earn a maximum of only 50,000 miles as the bonus. Via View from the Wing, Hilton is offering up to quadruple points per stay between October 10, 2013 and January 31, 2014. While registration is not available yet for this promotion, you can register here starting October 10, 2013. In addition, there are number of hotels that are not participating in this promotion. Via One Mile at a Time, IHG is offering up to a 50% bonus when purchasing points, through October 18, 2013. IHG Rewards hotels include Candlewood Suites, Crowne Plaza, Holiday Inn, Holiday Inn Express, Hotel Indigo, InterContinental Hotels & Resorts, and Staybridge Suites brand hotels. 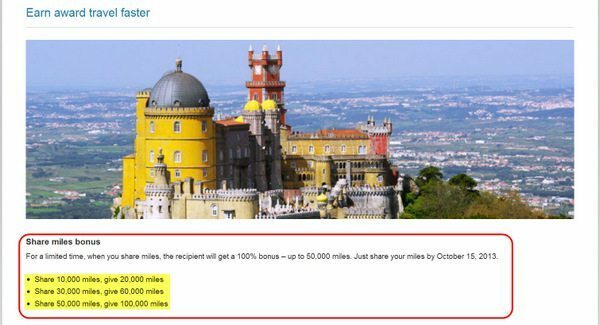 The best value is to purchase at least 40,000 miles at a 50% bonus, so you pay 0.77 cents per point ($11.50 per 1,000 points). You may be able to buy points for 0.70 cents per point, so this isn’t a great value. IHG Rewards points can be transferred to a number of different airlines at a 1:5 ratio. This is not a good deal and is an expensive way to earn miles. Using IHG Rewards points for hotel stays, though, can be a good value. Here’s IHG Reward’s award chart which start as low as 5,000 points for a PointsBreak award, and cost 50,000 points for a top-end InterContinental hotel. Darius, I appreciate your reply. However, this deal is only for whom already have over 50k miles in their account. Not worth for people, including myself, who do not have enough balance. To purchase, it costs over $1880 (to purchase) +$568 (to share). Vince – That’s correct. But you could start with 10K miles, transfer to B, then have B transfer back etc. But it may be too late for that now. How do you all get the $568/50K? When I tried to purchase 50k, it says $1750 + $30. @Vince – Try sharing miles instead of purchasing them! Would I be able to redeem Barclays arrival miles for the 100% transfer bonus cost on us airways? @meh – The transaction is coded from Points.com so I don’t know for sure if that qualifies as “travel” via the Barclays Arrival card. Will US Airways allowed me to share the miles twice to my husband’s account? He has about 40,000 miles and I was thinking to share 10,000 to his account, so he could share 50,000 to my account, then I share 40,000 to his. Our goal is to get the 50,000 bonus in each account. I know that there’s a $30 fee for each transaction. Thanks! @Priscilla – It should be possible and you’re limited to only a 50K bonus in each account. @rick b, I have two accounts with the same name and just had the points post for the first transaction. In the process of switching them back.